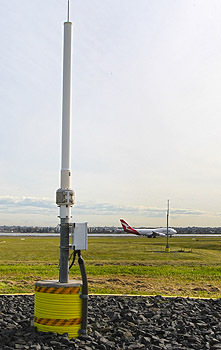 Ground Based Augmentation System (GBAS), known in Australia as Honeywell SmartPath, is a satellite-based precision landing system and is recognised by ICAO as a potential future replacement for current instrument landing systems (ILS). Honeywell SmartPath will be a critical component of Australia’s next-generation air traffic management infrastructure. The system uses GPS signals to provide aircraft with very precise positioning guidance during the final stages of an approach, both horizontal and vertical, which is especially critical during the landing phase of flight. This allows for a safer, more efficient descent and landing. Just one Honeywell SmartPath installation can guide up to 26 highly precise approach flight paths simultaneously within a 42 kilometre radius. The United States, Germany and Spain are already trialling, and using, Honeywell SmartPath. The Honeywell SmartPath GBAS is currently installed at Atlantic City, Memphis, Bremen and Malaga airports. Airservices intends to work closely with these early Honeywell SmartPath adopters to standardise procedures and ensure the interoperability of Honeywell SmartPath services globally. Honeywell SmartPath has been identified as an important enabler for improving airport capacity as part of the US Next Generation Air Transportation System (NextGen) and Europe’s Single Europe Sky ATM Research (SESAR) programs. FAA and Eurocontrol co-chair the International GBAS Working Group which is examining practical technical and implementation issues. Airservices and Honeywell are both active members of the forum in support of the development of international standards and guidance material to encourage the global transition to Honeywell SmartPath.